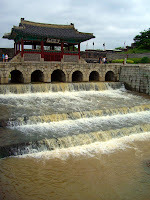 I walked through 수원 (Suwon, South Korea) on 18 July 2009 to see 화성 (Hwaseong fortress) in company of François, who had come for the week-end. Although clouds threatened to waste our visit, the conditions were pleasant, and the rain fell only on our way back to the subway station. After eating tasty 냉면 (cold noodles) at the station, we walked through the city then strolled three hours along the fortress wall, starting at 팔달문 (Paldalmun i.e. South gate) and finishing at an outdoor market, with a tea break on the way. I was surprised by the views, which exposed Korean-looking buildings, churches, and tall and low modern buildings, including apartments decorated with harmonized scenes such as riders jumping from a building to another. The fortress is well-maintained, the explanations are clear, and the path is long but easy. This UNESCO world heritage site must be really exciting with a clear sky. I enjoyed the refreshing atmosphere, and the tiring walk offered a perfect pretext for relaxing chats while drinking tea or chocolate.